The distinctive blue oval represents one of the most iconic brands in the auto industry. 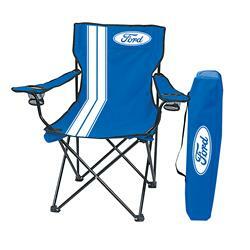 Now, you can display your pride while sitting in Ford folding chairs. They include mesh cup holders in each armrest and come with a storage bag to keep them up and out of the way. Each chair supports up to 225 lbs.